An interesting Facebook Discovery decision was handed down Judge Andrew H. Dowling by Order only in the Dauphin County case of Vogelsong v. Cruz-Ramirez, No. 2015-CV-234 CV (C.P. Dauph. Co. July 29, 2016 Dowling, J.). According to information gathered on the case, the issue before the court was whether defense counsel had to provide to Plaintiff's counsel, in response to Plaintiff's specific discovery request, all social media investigation completed on the Plaintiff before her deposition. 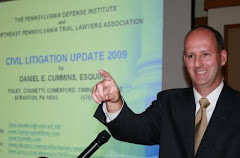 Judge Andrew Dowling of Dauphin County ordered the defendants to provide all social media research or investigation including Facebook, Linkedln, Twitter, You Tube, Instagram,Tumblr or any other similar research. The defendants' objection that this investigation is the same as surveillance and should not be produced until after plaintiff's deposition was overruled. The defense objection that it was work product was also overruled. In its Order the court did also hold that the defense did not need to produce video surveillance completed on the Plaintiff prior to her deposition. Anyone wishing to review this Order, may click this LINK. I send thanks to Attorney Robert Claraval of the Claraval Law Office in Harrisburg, PA for bringing this case to my attention.